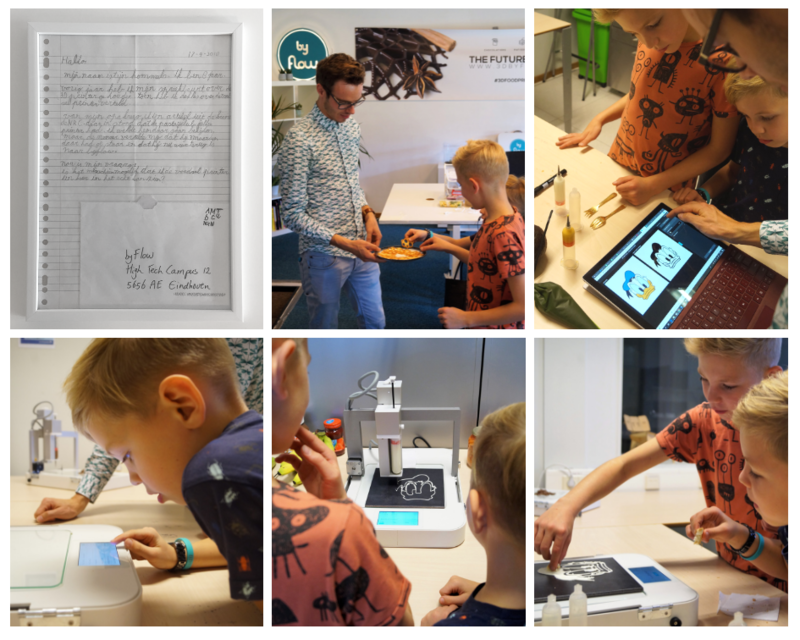 When Tijn (8 years old) had to prepare a school project about 3D printing his grandpa showed him an article about byFlow and the possibilities of 3D printed food. That’s the beginning of an amazing story, which goes much further than doing homework. A few weeks ago we found a surprising letter in our company’s inbox. Handwritten address, undoubtedly by a child. We were so flattered and amazed to find out a moment later that it was a message from Tijn - probably the youngest enthusiast of 3D Food Printing on the planet, and a declared byFlow’s fan. After preparing his school project about 3D-printing and reading about byFlow in the news, Tijn got so interested in our technology that he had to see the 3D Food Printer at work. We welcomed Tijn, his parents and younger brother in our office at High Tech Campus, Eindhoven, last week. After getting to know each other over 3D-printed cookies, we started the practical part of the afternoon - 3D Food Printing, step by step. 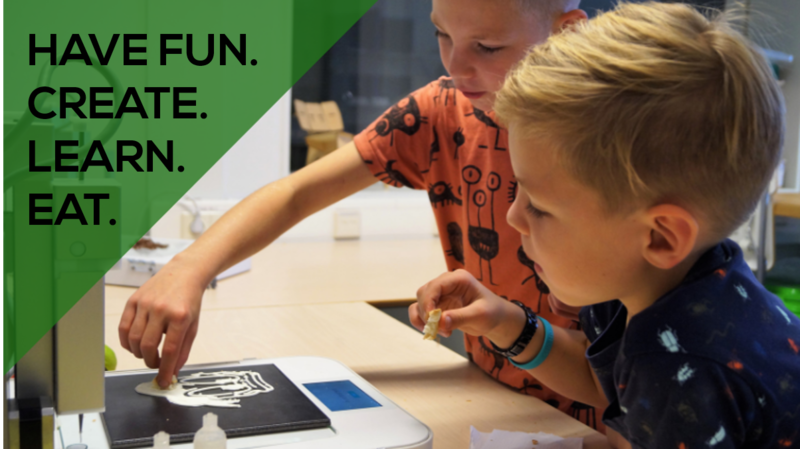 The boys made drawings by hand and assisted us in transforming them into printable files, learned how to use the Focus 3D Food Printer and, of course, finished with eating the final results! On the menu, besides the chocolate designs drew by Tijn and his brother, were cream-cheese Donald Duck and pumpkin-octopus. All 3D-printed, delicious and fun! The visit of Tijn and his family not only made us proud and happy - it has also assured us that the Focus 3D Food Printer is a great educational tool. It allows children to learn about nutrition, develop creative thinking and get familiar with new technologies - all 3 while having lots of fun! It’s inspiring, easy-to-use and offers endless possibilities for innovative educational projects. 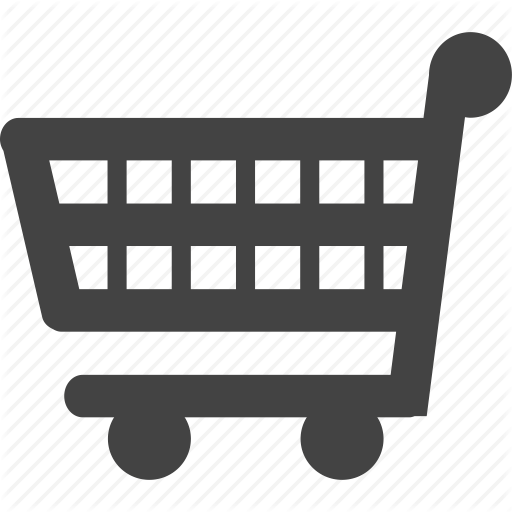 Do you want to learn more about the applications of 3D Food Printing for education? Get inspired by the projects of our reseller Campustore and get in touch with us! Or with Tijn - byFlow’s new and youngest 3D Food Printing expert!